4RALLY team will take start in Rally OiLibya of Morocco 2013 with 2 race cars. Pavel Loginov with Oleg Tyupenkn and Vadim Saveliev together with Spanish co-driver Ariel Jaton will both drive the renew Toyota Hilux T1 prepared by 4WD Jaton Racing. Both crews had a good race in Morocco in 2011 and now are going to improve results and enjoy the sands and dunes of Chegaga and Chebbi ergs. Pavel Loginov: “Morocco is a perfect place for real rally-raid where in ideal conditions you can test your driving skills and navigation, prepare for marathons like Dakar Rally and of course, to enjoy the beautiful landscapes and famous Ergs. I am happy to start again in this race and together with my co-driver Oleg Tyupenkin we will try to pass all the distance and show a good result. As well as in “Silk Way Rally 2013” we will fight for a top-10 in Morocco! Our car Toyota Hilux T1 is well-prepaid thanks to our partners 4WD Jaton Racing and after a short tests in sands we are ready for race!”. 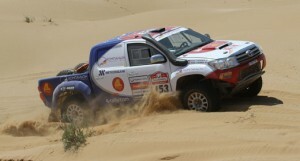 Vadim Saveliev: “I took part in rally of Morocco in 2011 on standard Toyota Prado in the category T2, but this year I will drive a new car – Toyota Hilux T1. After a short tests in September I felt a big difference between these two cars. Toyota Hilux T1 is much more powerful, lighter, maneuverable, than Prado. I like it! The main goal on rally is to pass all stages, to finish in top-20 and to enjoy the race! The unique experience which I can get during the Rally of Morocco in sands and dunes is very important and for sure, will give me a lot of positive emotions and impressions”.